USS PINCKNEY is named after Navy Cook Third Class William Pinckney, (1915-1975), recipient of the Navy Cross for his courageous rescue of a fellow crewmember onboard the USS ENTERPRISE (CV 6) during the Battle of Santa Cruz. When an explosion killed four of the six men at his battle station in an ammunition handling room, Pinckney and the other surviving sailor attempted to exit through a hatch to the hangar deck above. When the other man grasped the scorching hatch, he fell back unconscious. Despite the suffocating smoke, flames, and gasoline fumes surrounding him, Pinckney carried the sailor to safety. For his selfless heroism, Pinckney was awarded the Navy Cross. Bill, or ‘Bags’ to his friends, was a quiet man. If you were asked to pick him out of a crowd as one of only four African Americans to receive the Navy Cross in World War Two, odds are you might pick him last. Only proud to serve in the Navy, he never talked about medals or awards. Unassuming, he was just a man that always tried to do the right thing in his life, and succeeded. William Pinckney was born in Dale, South Carolina, on April 27th, 1915, to Renty and Jenny Pinckney. His father struggled to get by as a carpenter on the many shrimp boats in the Beaufort area. Bill’s mother passed when he was eight years old and his older sister, Ethel, raised him. A few years later Bill would drop out of school and start working himself, only finishing the seventh grade. Following in his father’s footsteps, he worked as a carpenter along the waterfront, eventually partnering with his brother-in-law prior to joining the Navy. While attending Robert Falls Elementary School, Bill did make one important discovery. Henrietta. Henrietta Pinckney was five years younger than Bill but they formed a friendship that would grow into a lifetime love. He would ask Henrietta to her first dance when she was fifteen and they were married eight years later at the Beaufort courthouse on November 6th, 1943. On August 3rd, 1938, William Pinckney joined the Navy to see the world. He attended boot camp at Great Lakes, Illinois, and then reported to the aircraft carrier USS ENTERPRISE (CV 6) as a Cook after completing ‘A’ School. He served on the ENTERPRISE for three years. At the Battle of Santa Cruz on October 26th, 1942, the carrier USS HORNET (CV 8) was sunk and the ENTERPRISE would be hit twice by Japanese bombs, killing 44 Sailors and leaving 75 wounded. It was here that William Pinckney would earn the Navy Cross and Purple Heart for his actions. USS Enterprise (CV 6) during the Battle of Santa CruzDuring the second bomb attack, a five-inch shell exploded in the magazine William was manning, killing four Sailors instantly and knocking him unconscious. When he came to, William found the magazine ablaze and full of smoke. Feeling his way out, he stumbled upon Gunner’s Mate James Bagwell, who alive but too weak to climb up the ladder to escape. Although taller and at least twenty pounds heavier than Pinckney, William threw Bagwell over his shoulder and started to climb. An electrical cable touched Pinckney and he was thrown back, once again knocked unconscious. When William regained consciousness, he fearlessly grabbed Bagwell a second time and successfully made his way up the ladder and eventually into the hangar bay. Once Gunner’s Mate Bagwell was safe, Pinckney went back down into the magazine, ignoring the burns that had taken the skin off his hands, right leg, and back. Fighting smoke and fire, he would only return from the space several minutes later after confirming the deaths of the others inside. He then collapsed and was treated. Pinckney was treated for shrapnel wounds and 3rd degree burns in Hawaii. While there he negotiated orders and spent the remainder of his eight years in the Navy at the Boat Basin in San Diego, California. He returned home to marry Henrietta and the two moved to Oceanside, California. On June 30th, 1946, William left the service as a Cook First Class. Mrs. Henrietta PinckneyHe and Henrietta moved from Oceanside to Brooklyn, New York, where Bill joined the Merchant Marine and Henrietta worked as a telephone operator. William served for 26 years in Merchant Marine as a cook on such ships as the AFRICAN MOON and SIR JOHN FRANKLIN. He was an active Mason and member of the American Legion in New York. After retiring, the two moved back to Beaufort. William Pinckney passed away in his home on July 21st, 1976, after a two-year struggle with spinal cancer. He is buried at plot number 3381 in the Beaufort National Cemetery. Henrietta Pinckney, who still lives in Beaufort, survives him. They have no children. Modest throughout his life, very few photos of William are available. Even at his own wedding no photos were taken. He never spoke about his time in the Navy or the incident in which he saved James Bagwell’s life. As far as Henrietta is aware, William may have never known the identity of the man he carried to the hangar bay that fateful day. When questioned about his time in the service, Bill would often tear up, saying only that he was ‘proud to serve’. This is now the motto of the ship that bears his name, the USS PINCKNEY (DDG 91), built in Pascagoula, Mississippi. ‘Bags’ enjoyed the simple things. Listening and dancing to the jazz music of Duke Ellington and following his favorite baseball team the Brooklyn Dodgers. Bill loved attending games, eating Coney Island hot dogs and fries at every opportunity. He loved to cook, often taking the kitchen over from his wife. The only food he was known to despise was beets, an aversion shared by the crew of the PINCKNEY. No beets will ever be served onboard. One other trait of William Pinckney’s has found its way into the ship. You can already see on the faces of every Sailor in the current crew that they have assumed ‘Bags’ quiet modesty and are, and will always be, ‘Proud To Serve’. The Shield: Gules (Scarlet) denotes courage and sacrifice. 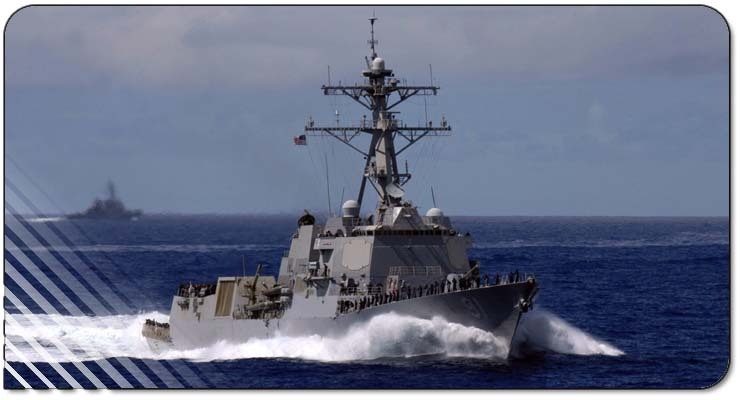 The black grid shaped like an Aegis shield refers to the destroyer class to which the Pinckney belongs and its state of the art equipment and armament. It also suggests a mess grill, symbolizing the duties of William Pinckney as Navy Cook Third Class aboard the USS Enterprise at the time of his heroic act in saving his shipmate. The trident symbolizes authority at sea. The eagle’s head denotes vigilance, resolve and seagoing defense of the United States. White (Argent) indicates integrity; black (Sable) signifies strength and fortitude. 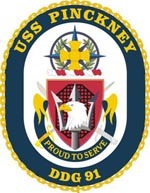 The Crest: The Navy Cross indicates the award for heroism made to William Pinckney for his exemplary actions under fire in saving the life of a fellow sailor during the battle of Santa Cruz. The compass-rose signifies navigational expertise and global action during World War II. The wreath of laurel represents honor and achievement.